The HOBO MX1101 data logger measures and transmits temperature and relative humidity data wirelessly to mobile devices via Bluetooth Smart technology. The self-contained wireless data logger, which works with Onset’s free HOBOmobile app for logger setup and data management, enables you to access data anytime from your iOS or Android mobile device over a 100-foot range, and it requires no dedicated equipment beyond an iOS or Android device for configuring the logger or reading out data. Using Onset’s free HOBOmobile app, you can view data in graphs, check the operational status of loggers, configure alarm notifications, and share data files. 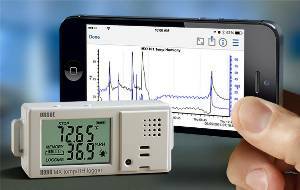 IMPORTANT: The HOBO MX1101 data logger requires the HOBOmobile App and a compatible mobile device.